Arrived perfect! After having a few issues with other items being delivered, my fingers were crossed.... absolutely stunning! Unique compared to what was available locally and truly impressed with the quality.. contractor installed. The DreamLine Enigma Air fully frameless, sliding shower or tub door has the ultimate combination of luxury and modern design. Striking stainless steel hardware delivers a perfect mix of exceptional quality and cool urban style. The Enigma Air glass is treated with DreamLine exclusive ClearMax anti-lime scale glass coating for superior protection and easy maintenance. Choose DreamLine for the ultimate solution for your shower project. Dimensions 1.0 In. X 60.0 In. X 76.0 In. 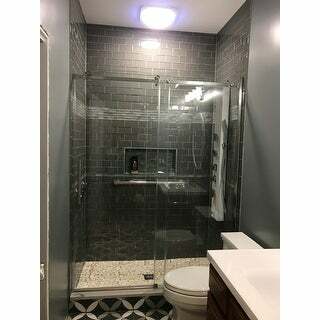 Quality shower doors. I recently recv'd a quote of $3k for shower doors at a local shower door distributor. Way over priced. OK, glass was a bit thicker but not worth the price. These are quality doors that work well. The polished stainless (that I chose) was too shiny for me so I requested an exchange just on the hardware so that I didn't have to return the full set of doors (expensive) and they sent me the brushed hardware, free deliver and free return label. Happy happy customer! Solid design with good directions that must be followed. Heavy feel and high end quality. Delivery was smooth and fast. The pictures are accurate. Good buying decision! Beautiful door that sets off new walk in shower. The roller system is very smooth and easy to move, even though the door itself is very heavy. Have not had any issues with leaking and am very satisfied with the door. I would caution about delivery. This door weighs 251 lbs and it was delivered on a 18 wheeler truck that the driver would not drive to our house. Other like-size trucks have come into our driveway but this driver refused to do so. In order to get the door we were required to drive to a nearby gas station and bring it to our house in our car. Luckily we have a mini van and were able to fit it in the back and the remodeler helped to get it into the house. Very pleased with the door itself and would recommend it. Just installed this shower door, What a great buy and looks amazing and fits perfectly. The rollers make it glide open and close easily. I was expecting a delay on delivery. But delivery was within two weeks and I expected maybe a month. My only wish is that they would open on both sides; although I knew that it would open from one side only. The price was absolutely fantastic especially for the quality and workmanship. I was looking for quality but also value I found it in the Dreamline Enigma. I has good reviews and comparing other name brands it is something that look and function properly nine, or ten years from now. Plus the bonus was the price that was several hundred dollars lower then the box stores or anywhere else that I could find. This is the type of purchase you don't want to have to make again until you remodel. The Enigma is very sturdy and well made and it makes the bathroom look even bigger, and more classy. Had a renovation on my bathroom and I decided no more shower curtains! this was the answer, it is great. It's not like the doors at grandmas house that collected guck in the tracks these doors have no tracks so everything stay nice and clean. I just rinse the glass after I shower and thats it no maintenance or new shower liners, I love it. The door is gorgeous once installed. It is very heavy and appears to be nice quality. The only issue we've had is the top of the door tends to slip a bit (down) and then the bottom gets hung and it won't glide closed. We then have to re-tighten the screws at the top (where it attaches to the tile wall). We've re-tightened that 3-4 times now and we've only had the door for 2 months. I told my husband this last time to tighten as tight as he could possibly get it and so far it's holding. We will see if that remains to be the case. These shower doors are attractive and will be a great update for our bathroom once we install them. Their frameless look is clean and modern. They were delivered promptly (less than a week). The delivery men left them in the garage. We will need to get extra help to move them to the bathroom as they are very heavy. This sliding door is absolutely stunning. It is the centerpiece of the bathroom. It slides effortlessly. Looks very high end. Instructions made setup a breeze. Doors are thick and feels sturdy. Thank you for an amazing purchase. We are so happy with the selection. It looks amazing. It is a heavy door, permanently attached to one side. The other half slides easily. Looks great cleans fast. more than I expected. Looks fantastic. Everything came labeled and in its own boxes. Directions sucked but besides that great buy. "Can this be curbless? Thanks." I don't believe so unless there was way to contain the water. However, I am not a contractor only a product user and doubt it seriously. There is one stationary panel and one sliding door. It is reversible for right or left hand opening. No, only one side slide opens.